← Vanilla Sheep -Need a little help girl? -Sort of Graphic Birthing photos.. I got asked a question in my comments from Julie, and decided to make a post out of it..I see that she has in fact done the same.. So in answer to her question of can you do it with raw whole milk, the answer is yes..my sheep milk yogurt does come out very thick, much like greek yogurt that you would buy in the store, where as both goat and cow for me at least comes out a bit thinner, but I noticed a difference in this depending on the breed of goat, which makes sense because the different breeds have a different buttermilk fat content. Now the reason that I have never done a post on the yogurt making is mainly because I have not done the make it in a thermos, make it in a crock pot, or even make it on a low setting of a heating pad.. I got a old fashioned yogurt maker at a farm sale in a box of goodies for a buck, so I most likely paid 5 cents for it, it has eight cups and you mix the milk, with the starter, fill the cups, set the timer and when it turns off, its done..
Because I have never done any of the other way, I can’t say that I have any cheap tricks or trades, but after Julies comment, I did a huh.. what if I had no power, how would I go about making my yogurt then? I poured boiling hot water into my shuttle Chef and put it into its outer pot and let it “warm” at the same time, I took out my starter and let it warm up to room temp. So I took a liter of fresh whole still warmish sheep milk, strained it, warmed it up 110, added the warmed starter, poured out the water, dried the inner steel pot and poured it into the pot and set it for the full eight hours in the shuttle chef.. it made a very good yogurt, not as thick as my normal one, I think if you let it sit longer it would get more tangy and full body flavour.. 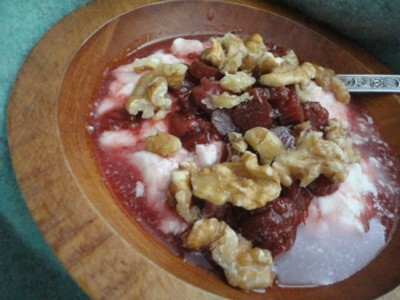 So this morning, I had a bowl of it with canned strawberry Rhubarb fruit with walnuts.. No quite as good as my normal yogurt but certainly better or equal to store bought.. 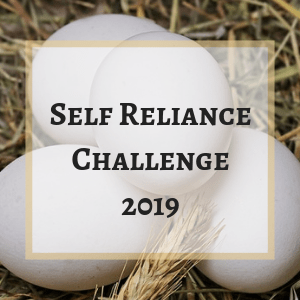 This entry was posted in Food Production and Recipes, Food Storage and tagged 100 mile food challange, Food Production and Recipes, Frugal, Sheep Milk. Bookmark the permalink. I make mine in a styrofoam cooler with a canning jar of hot water for warmth. Works awesome! This is amazing. I love sheeps’ cheeses, but they are so hard to find around here (and we live in an artisan-mecca!) I never thought about milking a sheep though… do you have pictures?? LOL, you surprised me with the terminology of the milking parts! I’m sorry not being concise, but all I was thinking of was how it looks “from here”, like a bystander looking on to see how it all works. In other words, sheep seems so low to the ground I’m not able to picture how things fit (a bucket?) Is there room, so you can even see what you’re doing? Do you put a ewe on a milking stand like a goat and give grain to distract her? And what if you have a long-haired sheep? I guess my questions are really a round about way of seeing if this would work for me. Hubby doesn’t want me to get goats- he wants a COW, and I have to say I’m a bit intimidated by that. I’m thinking I’d rather try a ewe, but I need convincing. Maybe we should just raise coconuts for milk…. I was hoping you’d do a post on yogurt! Thanks for the tips. I make my goat yoghurt with an insulated container but have also made it in a large stainless pot. I follow the same process as you do.Both the insulated container and the pot are lidded, of course, and then I wrap it with a terrycloth bath towel to hold-in some of that warmth. I keep mine on the kitchen counter and it turns out fine. Our kitchen is much cooler than other parts of our house so if I needed extra warmth I would simply set it near the woodstove to keep the temp. consistent. Homemade yoghurt — yum!! When I was younger and ignorant of yogurt making, I bought a yougurt maker at a garage sale. It had four cups with lids and a rectangle of cup seats in a warmer. In other words the cups fit inside their places in the long warmer thingie. Not knowing any better, I poured straight milk- no starter- into the cups and plugged it in. I got yummy yogurt, not as tangy as store-bought nor as thick, but it was yummy. So, I guess you don’t always have to have the starter? I’ve even had left over “cereal milk” turn to yogurt when a kid left it out on the counter. I use a thermos to make yogurt and enjoy the results. I tried the yogurt maker and it was okay, but it was a lot of extra dishes to wash and since I strain my yogurt, the little individual cups were sort of pointless. Cute, but pointless. I passed it on to a friend who is thrilled with it, so it’s a win-win.